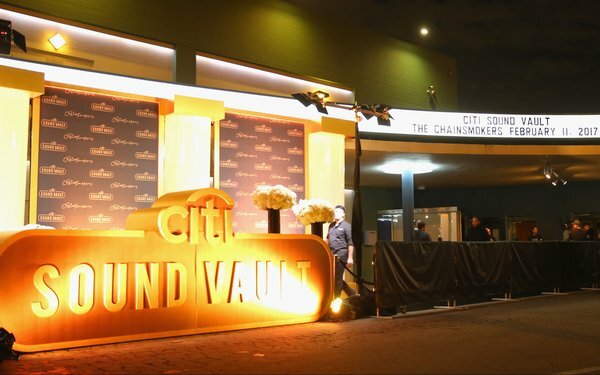 Citi is hosting its third Sound Vault takeover during Grammy week, expanding the experiential activation beyond arena-level performers. This year’s effort, from Feb. 7-10, will include Pink, Muse and Chris Stapleton at the Hollywood Palladium, as well as a limited edition merchandise collection with streetwear artist Trevor Andrew. The collection will launch on Feb. 7 via a pop-up experience, within the walls of the Hollywood Palladium, with items available to Citi cardmembers who purchased tickets to one of the three Citi Sound Vault shows. Net proceeds from all sales will benefit nonprofit Musicians on Call, which brings music to the bedsides of patients in healthcare facilities. In almost two years since it launched, Citi has executed 19 Sound Vault shows, resulting in over 1 billion marketing impressions, says Jennifer Breithaupt, Citi’s global consumer CMO. The five shows in New York City last year sold out in less than three hours. Previous performances have included Metallica, Katy Perry, Sting, Eminem and The Chainsmokers. “We’ve placed a big bet on experiential ever since we launched our entertainment platform over a decade ago,” Breithaupt tells Marketing Daily. “Since then, we’ve grown it into one of the largest consumer access platforms of any brand, offering more than 12,000 events with the world’s biggest artists to our cardmembers each year." Rounding out the week, Citi Sound Vault presents The Roots Jam Sessions, an invite-only event taking place Feb. 8-9. There will be a limited allotment of tickets exclusively for Citi cardmembers. Previous artists have included Miley Cyrus, John Legend, Lenny Kravitz and Ed Sheehan. As consumers’ attention spans continue to decrease within our always-on, digitized landscape (a Microsoft study puts it at 8 seconds), it’s become increasingly difficult for brands to break through, Breithaupt says. Live music can be that unifying force between consumers and a brand—especially with millennials, she says. Live Nation recently fielded a “Power of Live” study that showed 63% of fans are more likely to connect with brands while in a highly emotional environment of live music.